Delicate, airy and elegant, this is a cross of tradition, meaning and legend. 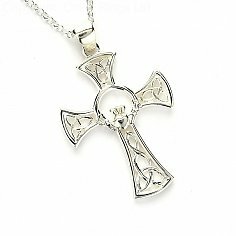 Enchanting Trinity knots make up the four parts of the cross itself. The center is a heart of gold encompassing the legend of the Claddagh symbol. True love separated by the sea the story goes, and the ring came to be. A heart held and supported by hands of friendship, and crowned by loyalty beautifully tells of happy endings boasted in blazing gold. The Claddagh ring is not just for fingers anymore, now the legend can be kept near your heart in a most elegant fashion. The piece is beautiful, the price was good and the delivery was accurate and on time. The only thing preventing 5 stars was the delay between taking the money and sending the order confirmation email. 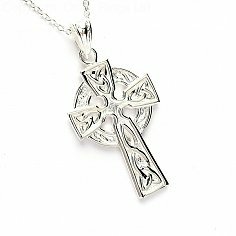 Service rating : Beautiful Irish Cross that my fiancee will love as a Christmas gift. The price and the delivery were right on. Follow-up is professional and timely. Very impressed! 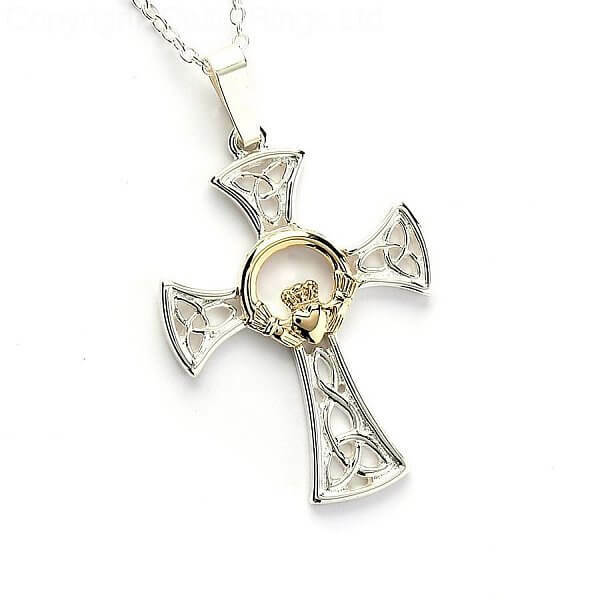 Product : Lovely Irish cross with the right design and mixture of metals. Very attractive. My compliments to the designer. Great Job!